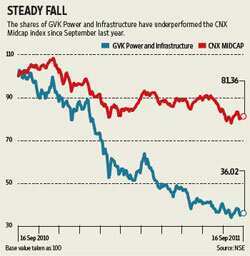 Shares of private sector infrastructure conglomerate GVK Power and Infrastructure Ltd (GVKPIL) have been steadily dropping for a year. Its market capitalization, at a mere ₹ 2,684.60 crore, is down to one-sixth of what it was in January 2008, when the Indian equity markets scaled an all-time high, and half that in January 2011. A series of positive developments have failed to affect its stock price, currently trading at ₹ 17. A few months ago, the firm had announced a private equity infusion, increasing equity stake in the airport assets to gain a controlling majority. Concerns about the group’s ability to fund its ambitions and the impact of the resultant leverage on cash flows and profitability in the medium term seem to have arrested investor interest in the firm. GVKPIL no doubt will have access to coal, with an equity exposure of only 10% in the Hancock entity (flexibility to increase it to 49%). Ninety per cent of the equity will be held by another group entity. But analysts have questions about the manner of funding. A $1 billion bank loan will be availed through a group entity, with guarantee provided by GVKPIL and GVK Natural Resources Pvt. Ltd. In addition, the media release adds that shares of GVKPIL’s energy and transportation subsidiaries (which house profitable businesses) will also be pledged. An analyst from a leading Mumbai-based broking firm says this increases the stakes of GVKPIL for back-ended cash flows that are expected only a few years down the line and where it has a minuscule equity interest. GVK promoters, however, are confident that the private equity interest in this segment, and more so with respect to coal assets in Australia, will help rope in such firms within the next six months to a year, to repay debt drawn for the purpose. Until then, say analysts, it would thwart any prudent use of the assigned guarantees and shares for growth of the respective businesses. Further, the group has to fund additional investment for the first phase of the development of the coal mines, estimated at around $10 billion over a few years. Meanwhile, given its limited wherewithal to finance stake increases in the airports, it would have to rely on borrowed funds, at least in the interim period. The move comes just when GVKPIL’s performance across business segments has been improving. It posted increased revenue and profits in its airport assets. The roads and energy businesses, too, clocked robust performance. Analysts’ consensus points to a profit expansion in fiscal 2012. GVKPIL’s debt to equity ratio is not directly impacted by such complex funding mechanisms. But business risks associated with such huge long-term projects will weigh down the stock, more so given the tough road ahead for the power sector and delay in real estate monetization on the airport front.